Forgot iPhone Backup Password, How to Reset? We adore Apple products not only for the powerful processors, advanced graphics, fast memory, and all the Apps but also for the easy way Apple offered us to backup important data. With iTunes, it is easy to backup iPhone contents in case of data loss from our iPhone, iPad and iPod. However if we forgot iPhone backup password (the password we used to encrypt backup files, and protect our files from unauthorized access), it can really be a problem. 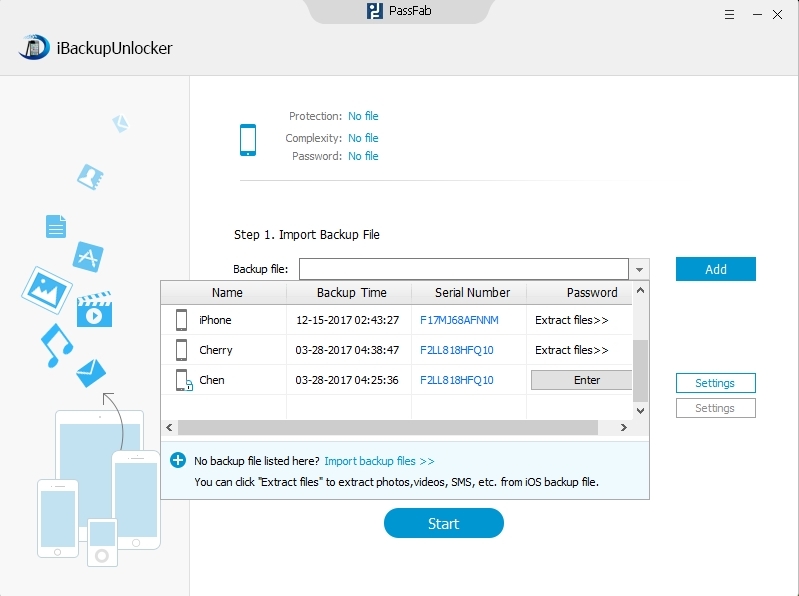 We are all aware of the fact that without backup password there is no way to restore iPhone from backup. Well in this post, we detailed a way to recover iPhone backup password. Hopefully it will be of some help. iTunes gives strong password protection to our data and in order to decrypt our backup password, we need the help of some professional password recovery tool. 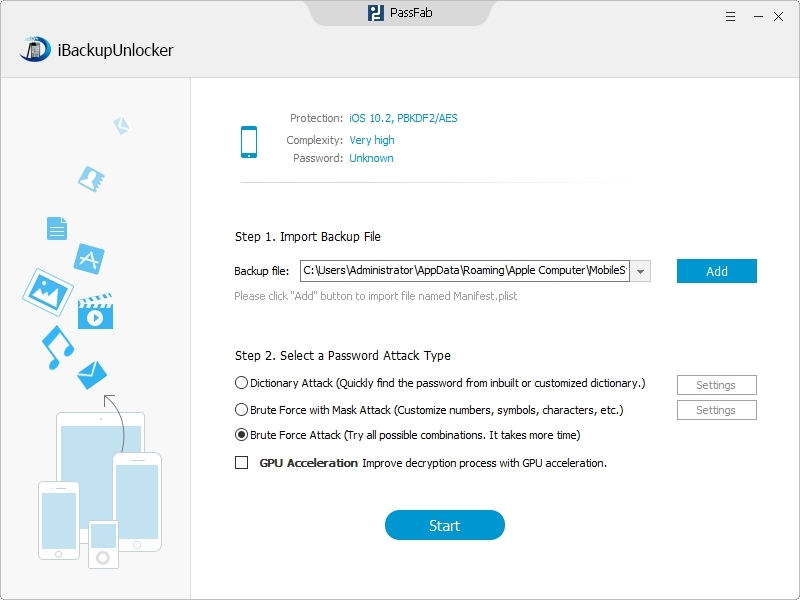 You could take my recommendation and try iTunes Backup Password Recovery, a tool that enables forensic access to password-protected backups for all iOS devices including iPhone, iPad, and iPod. Let's get started and see how it works to recover our forgotten iPhone backup password. Download and install iTunes Backup Password Recovery on your computer, then launch this program on your computer. The Manifest.plist itself is just a listing of all of the applications on the phone, with the files for each, and a separate listing of each file's attributes. In order to recover iTunes backup password for iPhone, iPad and iPod, we have to use this file. We only need to click "Open", and the program will automatically find this file for us if we have backed up or synched iDevices with iTunes. iTunes Backup Password Recovery provides three types of attack for us if we forgot iPod backup password or forgot iPhone, iPad backup password, namely Brute-force Attack, Brute-force with Mask Attack and Dictionary Attack. Choose one and then click the "Setting" button next to the attack types to define the specific items about each attack. If you choose Brute-force Attack, you do not have items to define. This attack will try every possible method to find forgotten password. Suppose you remember minimum length, maximum length, prefix or other thing about the password, you could choose Brute-force with Mask Attack, and then set the specific items. Dictionary Attack is your best choice if you can list your commonly used passwords and you're sure the backup password is among them. You are required to set a TXT file containing all these passwords and the program will try one by one for you. Besides, there is a dictionary for reference embedded in the program. In a few minutes time or more (depending on the complexity of your password), you will find the recovered password displayed on the interface of the program. During the recovery, you could click "Stop" to stop the recovery and then restart the process any time you want. If you forgot iPad backup password, all the steps you need to recover iPod backup password are the same. Next time you can't remember iPhone backup password, just let iTunes Backup Password Recovery do you the favor and recover password for you. 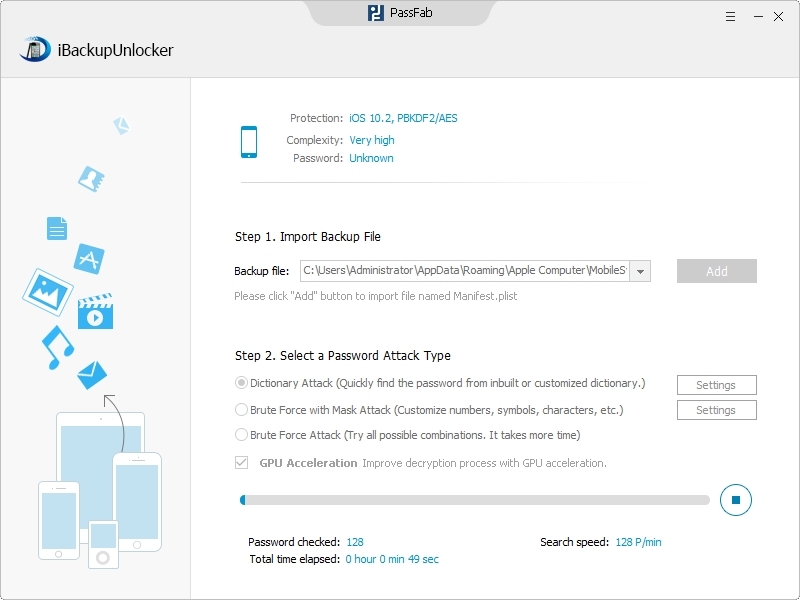 If you find this useful, share with your friends what your solution is when you forgot iPhone backup password. What to do if I Forgot red iPhone 7/6/5 Backup Password?